The 51.8 metre explorer yacht Jade 959 has had a central agency change and is now jointly listed for sale by MySea and Camper & Nicholsons International. Built in steel and aluminium by Taiwanese yard Jade Yachts to a design by JC Espinosa, Jade 959 was delivered in 2014 as a Bandido 170 Explorer model. An interior designed by Central Yacht has been carefully considered to be suitable for charter, accommodating 12 guests in six cabins comprising an upper deck owner's suite that is just as comfortable as the more conventional main deck master suite, with two doubles and two twins on the lower deck. In addition, the crew quarters sleep 10 staff aboard this yacht for sale. A saloon on the sun deck offers panoramic views as well as karaoke and cinema facilities, a dining area and wet bar. The variety of large and small, intimate and formal spaces onboard means it is both a flexible charter yacht and well-suited to business entertaining. Bureau Veritas classed and MCA compliant, Jade 959 is powered by twin 2,000kW MTU engines giving a top speed of 18 knots. Her special features include an ice classed steel hull, offering the possibility of world-wide travel. 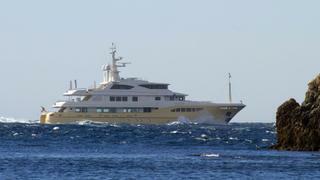 Jade 959 is asking €21,500,000.